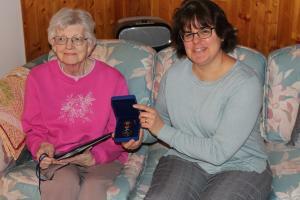 Commissioner Angélique Bernard visited Jean Smeeton at her home to present a certificate and the Sovereign’s Medal for Volunteers on behalf of Governor General Julie Payette. Jean Smeeton has been serving the patients and staff of the Whitehorse General Hospital for more than 44 years. As part of her long and faithful service with the Women's Auxiliary, her tasks have ranged from fundraising and pushing the tuck cart to providing secretarial services. She is committed to making the hospital a friendlier place for everyone. It was my pleasure to present the well-deserved certificate and medal to Jean Smeeton and to recognize her long dedication to the wellness of all Yukoners. It was wonderful to meet Jean and talk about the history of our wonderful territory and people. The Sovereign’s Medal for Volunteers recognizes the exceptional volunteer achievements of Canadians from across the country in a wide range of fields and pays tribute to the dedication and commitment of volunteers.